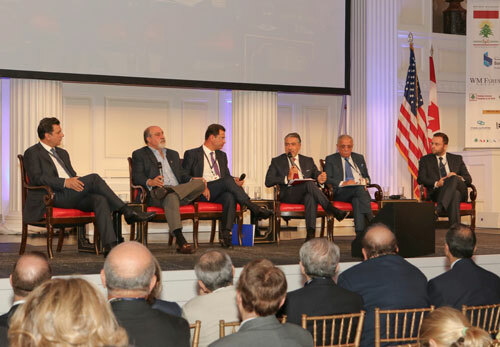 LAU alumni and representatives lead the way to boosting the country’s economy and its startup ecosystem at the Lebanese Diaspora Conference in New York. The conference brought together some of the best and brightest Lebanese in North America. Since the second half of the 19th century, the Lebanese have been migrating and settling in various geographic regions of the world. They are known for achieving upward mobility and have become the source of critical revenues, through remittances and investments, while providing knowledge, investment, trade, and global business connections. LAU’s engineering alumnus and former Board of Trustees member and chairman Paul Boulos is one such success story, having started his own water engineering company, Innovyze, that develops and provides wet infrastructure business analytics software. The event was hosted on September 16-17 by the Lebanese Ministry of Foreign Affairs and Emigrants. “The idea for the LDE conference came about after LAU NY held a successful diaspora panel in March 2015 at LAU New York,” explained LAU NY Academic Executive Director Lina Beydoun who worked closely with the Consul General of Lebanon in New York Majdi Ramadan in organizing the conference, which brought together some of the best and brightest Lebanese in North America. Several LAU graduates were among the panelists, whose role it was to come up with solutions to Lebanon’s problems, and produce policy recommendations. In an effort to support Lebanon’s startup ecosystem and offset the ‘brain drain,’ in 2014 the Lebanese Central Bank launched Circular 331, providing funding and loan guarantees for startups. Fadel, who runs an intellectual property management software company based in New York, has taken advantage of the program to hire and cultivate Lebanese talent. “We invested heavily in training engineers and quality assurance personnel. In the past 18 months, we have increased our staff in the Beirut office from 12 to 42,” he said. Aware of the community it serves and its challenges, LAU has been adapting to market needs by increasing its graduates’ chances of getting jobs after graduation. In this regard, President Joseph G. Jabbra, who participated in a panel about educational partnerships, announced that the university will soon establish an innovation center thanks to a $3 million gift from a Lebanese businessman and philanthropist. “Out of firm conviction by LAU that the 21st century belongs to the innovators, this center will allow our students and faculty to come together and be creative in their thinking and in the implementation of their new ideas,” he said. Following each panel, members of the audience were given the chance to question the panelists and offer their own advice. In addition to making recommendations, the LDE conference was an opportunity for entrepreneurs, universities, and foundations to collaborate and establish a network from around the globe.